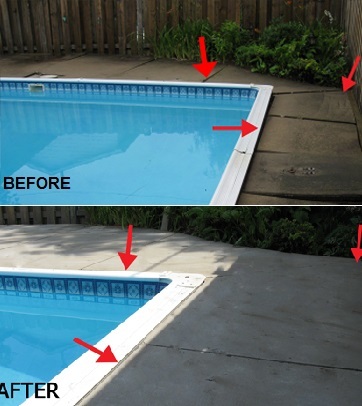 Liftec Slabjacking Inc., raises sunken slab on grade concrete, which helps to reduce the need of ripping out a concrete pool deck and having to replace it. Liftec was established in 1999 and has over 55 years of combined experience. Liftec is currently the only southern Ontario company that can use its own equipment to complete either method. When it comes to raising concrete around pools, Liftec’s experience and knowledge is second to none. There are many variables when it comes to raising pool deck slabs, including which slabjacking method suits each pool installation type. Liftec will explain on-site which method should be used and why. Liftec has been recommended by numerous pool companies over the years to help satisfy their clients' needs. The company strives to leave each customer with a good experience from point of contact to completing the job. Pumps are the heart of a pool circulation system—not only are they the vehicle that moves water through the various systems, but also now the focus of substantial rebates which can drastically reduce the costs of owning andoperating a pool. Headlines from various news outlets across Canada and the U.S. this year have summed up what this author heard from aquatic facility operators on a weekly basis—a shortage of lifeguards exists within the aquatics industry. However, is this really the case?